Our Planet: Where was the camera? Further to my recent post on Netflix’s Our Planet, and its claims about walruses flinging themselves off sea cliffs in Siberia, I started to wonder about the geography of the events that took place that day in 2017. First, take a look at the lie of the land. We know that the Our Planet footage was taken roughly at the place shown in Figure 1. Figure 1. 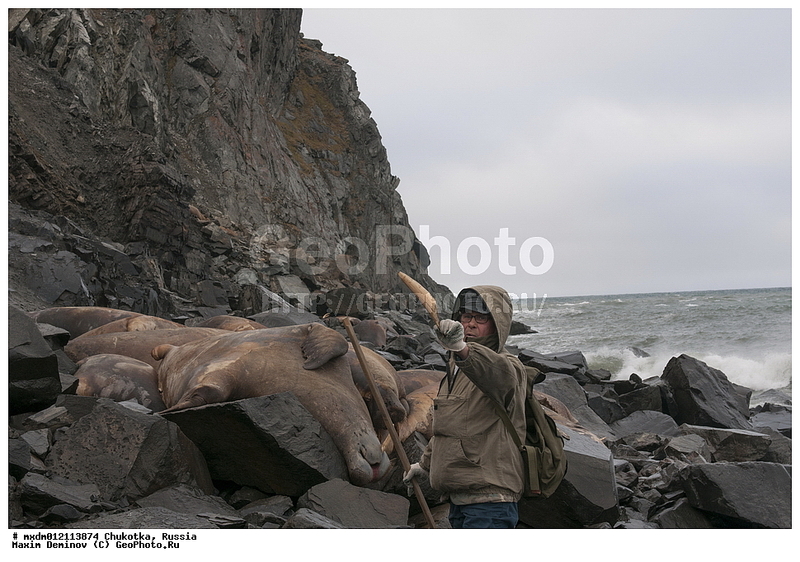 Archive photo of dead walruses at Ryrkaypiy. …but my money would be on the side nearest us in the picture below, near where the cliffs fall to sea level. Figure 3: As above, but from the east. This surmise is confirmed by the following two stills from the “Behind the Scenes” video here. In Figure 4, the scientist interviewed can be seen against the backdrop of the village. The building indicated can be identified as Ryrkaypiy school, and the rising land behind his back appears obvious in Figure 3. Figure 4. A still from the behind the scenes video. In Figure 5, we see the One Planet cameraman at work, with a group of walrus ahead of him at the foot of the cliff. The land appears to be opening out somewhat. Figure 6: Cameraman, with walrus in the water behind him. If we now consider the geography of the site, it starts to get interesting. The walrus up on the cliffs could see, hear or smell other walrus in the water below them and on the rocks at the water’s edge below. Obviously, they want to rejoin their fellows. But there is a problem. Northwards, there are only cliffs. To the west and south, there are beaches, but these are around 500 m away and it is more than likely that the polar bears were in that direction (why would they leave an area where there were so many dead walrus on which to feast?). Add in the fact that the camera crew were also flying drones over the cliffs. and you have a recipe for panic. But – and this is the crux of the matter – The best safe route back to the water would be to redescend to the water’s edge…to the exactly the point where the camera crew seem to have been located. Figure 7: The geography of the incident. So did the Our Planet team actually play a part in the tragedy? The post Our Planet: Where was the camera? appeared first on The Global Warming Policy Forum (GWPF).